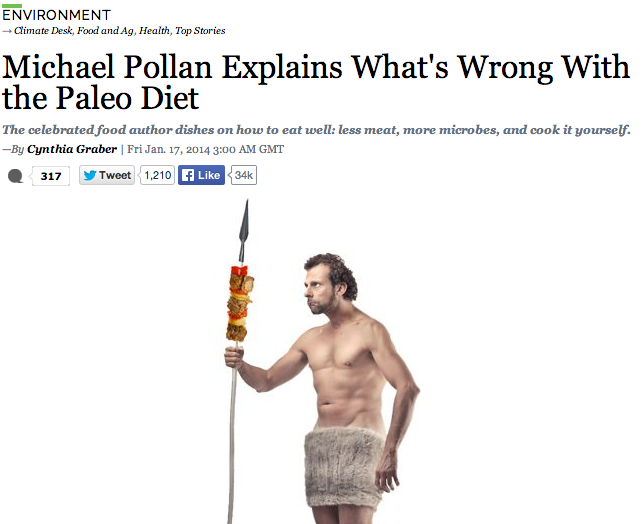 Last week, my dad sent me a link to an article about Michael Pollan and the Paleo diet. He knows that I'm a big fan of BOTH, so it made sense that he'd forward this to me, and I was eager to read it. You can read the original article here: Michael Pollan Explains What's Wrong With The Paleo Diet"- The celebrated food author dishes on how to eat well: less meat, more microbes, and cook it for yourself.". Based on the title, you'd logically assume that this interview was just that: The Great Michael Pollan going through reasons why the "paleo diet" is wrong. If you read the full article, you may still think that. But, if you listen to the actual interview... you see this title is completely misleading. (And yes, that's what all we modern paleo lifestylers look like. First, I read the article (by Cynthia Graber), and immediately sent my reactions back to my dad. To be clear, my gripes below are with the article's framing and titling, not with Pollan's arguments. Thanks, but disappointing. Once again, another article that says it busts the paleo diet, but clearly doesn't understand it and actually does little more than agree with it. All he's doing here is promoting his book. 1. Modern paleo is NOT just about replicating cavemen, which is all the media keeps saying about it. They clearly don't do their research. 2. Ancient bread is nothing like modern bread, which is why paleo people don't eat it. Many paleo/primal leaders (see Mark's take, for one) do concede that ancient grains, if properly prepared, may be digestible and/or beneficial. 4. Paleo people are not raw dieters? I don't even understand what that's doing there in an article claiming to be about paleo. It's a promotion ofCooked. 5. ... Again promoting the book. I just woke up so didn't listen to the podcast yet but from the article alone, I'm angry that the author titled it "Michael Pollan an busts paleo myths" instead of what it really was--"Michael Pollan busts two misguided assumptions about paleo, and makes three other points regarding how to eat well." Authors use the word "paleo" in headlines because they know it will draw attention. The interview with Pollan doesn't actually begin until minute 13:30, and continues through minute 54. I'll run through it now, quoting some of the relevant parts heavily because I want to make it clear that he's not shunning paleo as much as the article title makes it sound (in fact, it may be the opposite!). Pollan begins by discussing his general research into the human food cycle, the "elements" / compounds involved in cooking (as explained in his latest book, Cooked: A Natural History of Transformation--which I bought for myself last summer, by the way!) , and flavor combinations. and the benefits of cooking (the "first" element)--both flavor and health. "Cooked food tastes better" -- putting heat to food "transforms the flavors"
"[Cooking] makes the diet more varied!" Cooking the same thing in different ways draws out different experiences. On health: "Our ability to digest food and the safety of that food" are improved with cooking. "The discovery of cooking was a major event in our evolution as a species," he says. "We probably couldn't survive on a raw food diet, much as some people try to do. But you'll notice that the people who try to eat a raw food diet, they're very blender-dependent, because you simply don't have time in the day to chew all the food you need to chew to survive, to get that much nutrition. And the reason is when you cook food, you get more nutrition out of it." He explains how heat begins the breakdown of long-chain carbohydrates and proteins, and how that "externalizes some of the work of digestion", so when you cook food, "your body doesn't have to work so hard" to break things down. Cooking "gives you the ability to eat foods that are poisonous raw!" So you see, he criticizes a raw diet first, but that's not addressed in the title or tagline. He then moves on to talk about fermentation, one of the central processes of cooking. This is addressed in the article, and, as I mention above, this is perfectly in line with the paleo diet, which--as proven by the number of cookbooks out there (including Fermented: A Four Season Approach to Paleo Probiotic Foods )--is a big cooking-centered lifestyle. Next up, they discuss eating cooked meat. Graber asks, how does this fit with his recommendation to eat a mostly plant-based diet? "We don't know how much meat early man ate; we know he ate meat, and that meat was an important part of the diet, but it may well be that it was kind of a spasmodic thing, where you ate meat when you could get it, and it was hard to get, and at various times became even harder to get. So I think people gorged on meat when they could, and then ate a lot of other things to tide them over. Um, and that's still true, with hunter gatherers, today, they tend to kind of gorge, partly 'cause they don't have good methods of preservation, so if you get meat, you'd better eat it in a couple days. He doesn't say moderation is the surefire answer; he simply says we don't know enough about the ideal proportion, and that no one who makes claims one way or other other has enough evidence to back them up. Sounds fair. Pollan reminds us that the meat we eat today is very different from the meat our ancestors found, which the article does explain. "The other point about it is that the meat we eat is not the same meat available to our ancient ancestors. We eat meat that has been raised on feedlots, on a very rich diet of starches that has been shot up with antibiotics and hormones, and you'll find that it has a very different fat profile. Wild meat, when we get it, is a very healthy, very nutritious food, and it has a very favorable relationship of omega-3s to omega-6s. Feedlot meat [...] has a very unfavorable proportion of omega-3 to omega-6. She asks: "You say wild meat, but isn't the profile of, say, a truly grazed animal more similar to what would have been..."
He answers:" Yes, if you can eat pastured animal protein, you're getting a lot closer." This, too, is in perfect agreement with paleo principles! Pick up any scientific paleo book and it will talk about the omega-3-to-omega-6 ratio, and how today's grain-fed cattle are yielding meat with undesirable or even detrimental imbalances. Those who live a paleo lifestyle do their best to find pastured animals, fed their natural diets, as much as possible! Sometimes this is difficult given the landscape of modern meat production, but paleo followers are aware and try to find humanely raised, close-to-wild animal meat and eggs when possible. The author of the article concludes, "So, basically, enjoy meat in moderation, and choose pastured meat if possible." Pastured meat is #1 on a paleo shopping list, yet "Pollan explains what's wrong with the paleo diet" is the title of this interview?? Pollan touts sourdough cultures and says, "we took this brilliant technology and we kind of screwed it up. The industry became most concerned not with making a nutritious product but with making bread as fast and cheaply as they could." ... So he seems to agree that much of today's modern bread and gluten is not beneficial (or that our modern gut microbes can't handle them anymore) and has caused more negative reactions to gluten today, even if properly prepared grains are still tolerable for many. The rest of the interview is about getting people to COOK more, how Cooked fits into Pollan's prior work, and what recent science he's discovered (on "plant intelligence"--fascinating!). I dare you to listen and learn! All in all, I really ENJOYED the interview!! Pollan is a brilliant man; his work has long fascinated me, which is why my dad always sends me articles written by him. The interview/article does not taint that view; I'm still a big fan! What I'm not a fan of is authors using the words "Paleo Diet" to gain readers and viewers and high ranks on google searches. I'm not a fan of people taking someone's insights and changing them to suit their own ambitions or beliefs. I'm not a fan of people claiming to debunk something about which they clearly understand very little. A different interview with Michael Pollan via GoodReads.com quotes him saying: "The idea behind paleo is sound. It's probably the diet we evolved to eat." He then explains that it has a lot of plants, not too much grain, and a lot of meat. He reiterates his points against modern feedlot meat and discusses the grain debate (saying whole grains are important and that we DO have enzymes today to digest whole grains). He also says that paleo is "far superior to the standard American diet," even if "we have to update a little bit" based on our evolution since paleolithic times. He may not agree with it 100%, but it certainly doesn't sound like he's calling it wrong, either. Pollan's popular slogan of "Eat real food. Not too much. Mostly plants." is reflected here, as well, and the message of this interview seems to me to be: whatever you eat, just make sure you cook it yourself. He says that meat, bread, plants all have potential to be healthful, as long as they're properly prepared, so get into the kitchen and COOK. A valuable plea, one with which I could easily get on board. Dare you to dig deeper, to go directly to the source behind an article. Dare you to question others' assumptions. Dare you to call out those who misunderstand and misrepresent something you value. Dare you to debunk the debunkers, and seek the truth for yourself! Do you think the article and title accurately represent the discussion? 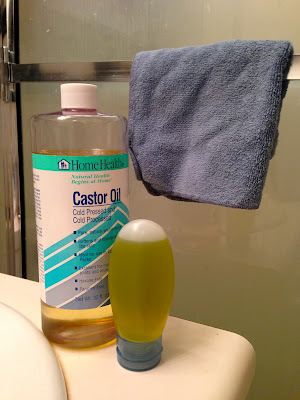 *Post may contain affiliate links. See site disclaimers for details. Block Out Blue Light at Night! Take an Active Vacation -- Visit Sedona!